Photo taken May 2015, Chicago Public Library. කෙලෙස් සයුර (Keles Sayura) — I couldn’t find a good translation for this. Keles = something about impurities, Sayura = ocean. Please comment below if you can translate! Thanks! Written by ජී. බී. සේනානායක, G.B. Senanayake, Sinhala novelist, short story writer, and poet. He is credited with introducing free verse poetry to Sinhala, and for famously writing 20 of his novels late in his life, while losing his eyesight. 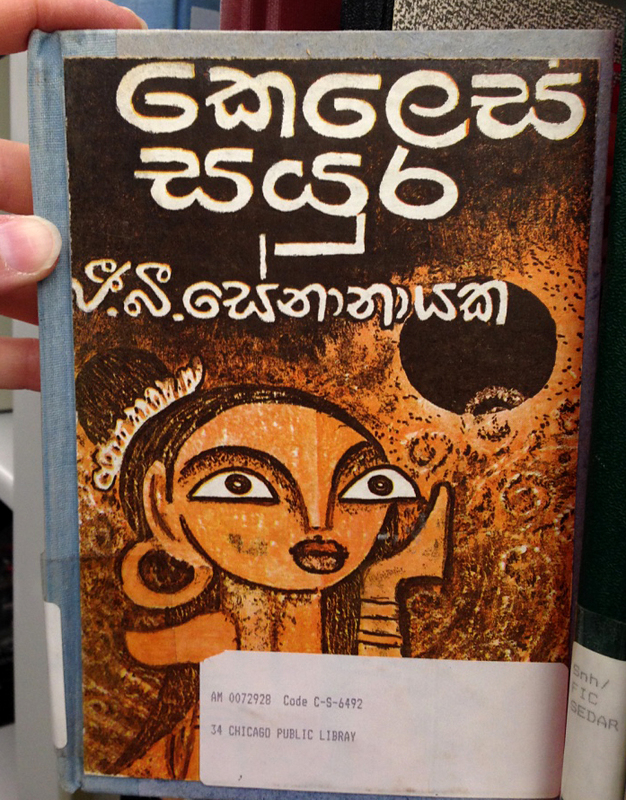 Examples of Sinhala have been some of the most difficult for me to find here in the United States, among the major S. Asian scripts. I was so excited when I saw the large collection of novels at the Chicago Public Library — especially due to the numerous hand-lettered covers! I haven’t had much exposure to the more simplified, monolinear forms used by lettering artists and in handwriting. I am usually only exposed to letters that resemble the high-contrast, rather ornate text typefaces used in the interior of these books.